Register for new 24k Retrievers classes. Working with animals has always been my passion. Over the past decade I have had the opportunity to work closely with animals in a variety of settings from ensuring their health and safety as a veterinary technician to fast-paced agility trials, and many places in between. I have been training and competing with my own dogs in the American Kennel Club and the United Kennel Club since the year 2000. 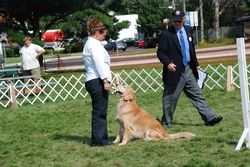 We have had great success in various competitive contexts such as Obedience, Rally, Agility Trials and Barn Hunt competitions as well as Hunt Tests. All four of my current competition dogs have earned High in Trials. I was a member of the Tallahassee Dog Obedience Club for years and served on the Board of Directors. I was also a member of the TDOC Training Committee from 2001 until August 2009, which afforded me the opportunity to assist and instruct in a variety of obedience classes with many different breeds. My other affiliations include: Golden Retriever Club of America, Mid-Florida Golden Retriever Club, United Kennel Club Hunting Retriever Club, and Delta Society Therapy Dogs-Pet Partners. I look forward to sharing my skills and experience with you and your dog.